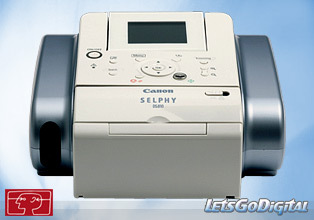 Canon SELPHY DS810 printer : Canon adds a new SELPHY compact photo printers to its home photo printing line-up. They produce durable 100-year photolab quality prints for as little as €0.30 per print. The new printer is the compact photo printer compact photo printer SELPHY DS810. A compact, function-packed, creative direct ink jet printer with PictBridge support. Provides connection to popular memory cards, with iRDA and optional Bluetooth for printing to compatible camera phones. Features a FINE (Full-photolithography Inkjet Nozzle Engineering) print head and 2 picolitre, 4800 x 1200dpi resolution for 63-second photolab prints. Includes a 2.5-inch LCD monitor and integrated software for editing, enhancing and printing images. The new addition to the SELPHY Compact Photo Printer range confirm Canon's commitment to the home photo printing market, which saw 300% growth from March 2004 to March 2005. 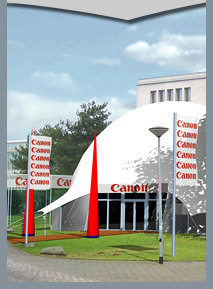 "In an accelerating market, Canon's unique heritage and expertise in imaging gives consumers more options on technology, connectivity, portability and pricing," said Mogens Jensen, Head of Canon Consumer Imaging Europe. The printing proces produce grain free prints with smooth tones, high colour fidelity and a 100-year lifespan1 that rival silver halide quality and longevity. Canon DS810 printer - Photolab quality : The compact photo printer Canon DS810 uses Canon's patented FINE technology, which employs long print heads with exceptionally high nozzle count and density. These print heads get more ink onto the media in less time than is possible with traditional inkjet technology, delivering millions of microscopic 2 picolitre droplets each second with extremely high consistency and accuracy from 10 micro mm diameter Micro-Nozzles. For improved fade resistance, the compact photo printer Canon SELPHY DS810 supports Canon's new ChromaLife100: a system of genuine Canon dye-based inks and specialised photo paper designed to work in concert with FINE print heads. Canon SELPHY DS810 - Stylish and Portable : With its smooth contemporary lines, the compact Canon photo printer DS810 is designed to look at home next to living room appliances such as TVs and Hi-Fi systems. Combining style with ease of use, the large bright LCD monitor is centrally located next to the printer's intuitive control buttons for quick and easy image selection, editing and printing. The new SELPHY compact photo printer comes supplied with Easy-PhotoPrint for printing from a Windows PC, It includes features such as Face Sharpening for out-of-focus face correction, Red Eye Correction and Digital Face Smoothing to reduce the appearance of wrinkles. For connection and printing from Macintosh systems, the compact photo printer Canon SELPHY DS810 comes supplied with a version of Easy-PhotoPrint for Macintosh. Canon SELPHY DS-810 - Printing made easy : The compact photo printer SELPHY DS810 supports direct printing from all PictBridge compatible cameras and allows printing from most popular memory cards. When printing from memory cards, the intuitive 2.5-inch LCD monitor provides access to built-in editing features such as Red-Eye reduction, Noise reduction and Face brightener. Printing from mobile phones is growing in popularity throughout Europe. 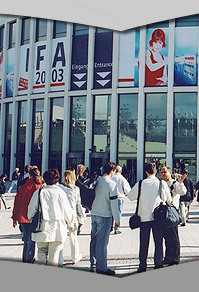 The volume of photos printed from camera phones is forecast to grow from 1.4 billion in 2004 to over 9 billion in 2008. An increasing number of mobile phones now support PictBridge, allowing connection with all the new Canon SELPHY printers. The compact photo printer Canon DS810 also offers IrDA and optional BlueTooth for printing from compatible camera phones, and an Image Optimizer function for enhancing print quality from camera phone images. The Canon SELPHY DS810 photo printer creates prints on a variety of media finishes from ultra glossy to satin. • 10 x 15 cm mini stickers - 16 stickers per page (Canon PS-101).